Bundaran HI Pedestrian Bridge (JPO) demolition on Jl. MH Thamrin, Central Jakarta is accelerated. This demolition is divided in two stages.
" We have preparing pelican crossing to replace JPO"
In the first stage, PT. MRT Jakarta Corporate Secretary Division Head, Tubagus Hikmatullah said, JPO above the west side of Jl. MH Thamrin is started to be demolished on Monday (7/30) night at 9 PM. "Second stage will be started on Tuesday (7/31) dawn at 1 AM to 6 AM. We will demolish JPO on the east side of Jl. MH Thamrin," he explained, Monday (7/30). Meanwhile, Jakarta Transportation Dept. Deputy Head, Sigit Widjatmoko mentioned to deploy 50 personnel to assist traffic engineering thus JPO demolition process could run smoothly. "JPO demolition previously is planned to be done in two days. But we accelerate it to finish in one night," he affirmed. 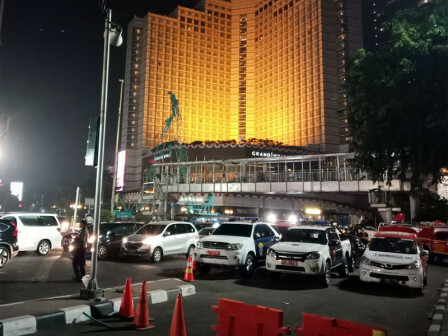 During the first demolition, his personnel are standby on Hotel Indonesia to direct vehicles from south (Semanggi) to north (Medan Merdeka) direction to pass through Jl. Imam Bonjol-Jl. Agus Salim-Jl. KH Wahid Hasyim, and then turn left to go through Jl. MH Thamrin. "We have preparing pelican crossing to replace JPO," he added. For information, during second demolition, vehicles from north (Medan Merdeka) to south (Semanggi) direction are directed to go through Jl. KH Wahid Hasyim-Jl. Agus Salim-Jl. Gereja Theresia-Jl. Yusuf Adiwinata-Jl. Imam Bonjol-turn around at Imam Bonjol intersection-Jl. Pamekasan-Jl. Jenderal Sudirman.